A broad-ranging survey of technology leaders, scholars, industry officials, and interested members of the public finds that most experts expect attacks on the network infrastructure in the coming decade. Some argue that serious assaults on the internet infrastructure will become a regular part of life. 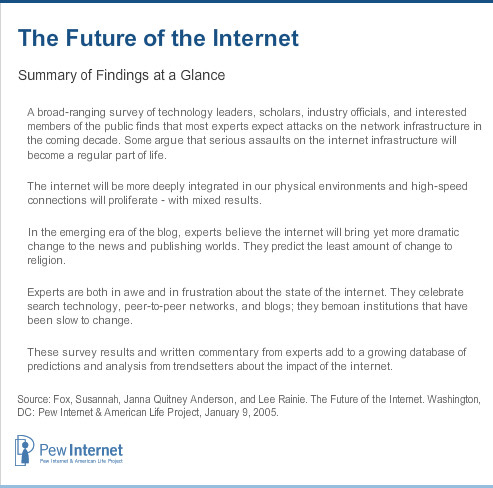 In September 2004, the Pew Internet Project sent an email invitation to a list of respected technology experts and social analysts, asking them to complete a 24-question survey about the future of the internet. We also asked the initial group of experts to forward the invitation to colleagues and friends who might provide interesting perspectives. Some 1,286 people responded to the online survey between September 20 and November 1, 2004. About half are internet pioneers and were online before 1993. Roughly a third of the experts are affiliated with an academic institution and another third work for a company or consulting firm. The rest are divided between non-profit organizations, publications, and the government. This survey finds there is a strong across-the-board consensus that the internet will become so important to users in the coming decade that the network itself will become an inviting target for attack. By a nearly 3-1 margin, the experts in this survey expressed worry about the vulnerability of the internet and the likelihood of an attack on the underlying infrastructure within the next ten years. Some 66% agreed with the following prediction: At least one devastating attack will occur in the next 10 years on the networked information infrastructure or the country’s power grid. As one expert wrote, “A simple scan of the growing number and growing sophistication of the viral critters already populating our networks is ample evidence of the capacity and motivation to disrupt.” Eleven percent disagreed with the prediction and 7% challenged it, including some who argued that they did not expect any attack to be serious enough to involve loss of life or a very long outage. The internet will be more deeply integrated in our physical environments and high-speed connections will proliferate – with mixed results. There was little disagreement among experts that broadband adoption will grow and that broadband speeds will improve. Nor was there much doubt that vastly more people and objects would be linked online in the next decade. Experts envision benefits ranging from the ease and convenience of accessing information to changed workplace arrangements and relationships. At the same time, a majority of experts agreed that the level of surveillance by governments and businesses will grow. 59% of these experts agreed with a prediction that more government and business surveillance will occur as computing devices proliferate and become embedded in appliances, cars, phones, and even clothes. 57% of them agreed that virtual classes will become more widespread in formal education and that students might at least occasionally be grouped with others who share their interests and skills, rather than by age. 56% of them agreed that as telecommuting and home-schooling expand, the boundary between work and leisure will diminish and family dynamics will change because of that. 50% of them believe that anonymous, free, music file-sharing on peer-to-peer networks will still be easy to perform a decade from now. At the same time, there were notable disagreements among experts about whether internet use would foment a rise in religious and political extremist groups, whether internet use would usher in more participation in civic organizations, whether the widespread adoption of technology in the health system would ameliorate the most knotty problems in the system such as rising costs and medical errors, and whether internet use would help people expand their social networks. Just 32% of these experts agreed that people would use the internet to support their political biases and filter out information that disagrees with their views. Half the respondents disagreed with or disputed that prediction. Only 32% agreed with a prediction that online voting would be secure and widespread by 2014. Half of the respondents disagreed or disputed that idea. 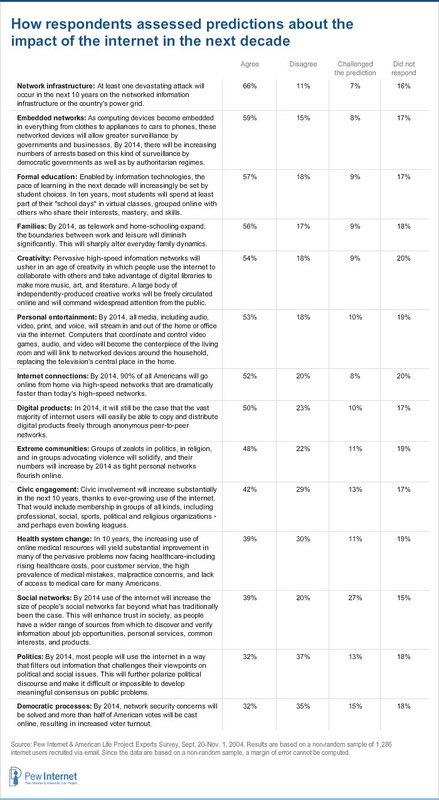 Asked to rate the amount of change that is likely in a variety of institutions in the next decade, the internet experts predicted the most radical change in news and publishing organizations and the least amount of change in religious institutions. They also predicted large-scale change to educational institutions, workplaces, and health care institutions. They believe that families and communities will experience change, but not as much as other social arrangements. Pleasant surprises: These experts are in awe of the development of the Web and the explosion of information sources on top of the basic internet backbone. They also said they were amazed at the improvements in online search technology, the spread of peer-to-peer networks, and the rise of blogs. Unpleasant surprises: The experts are startled that educational institutions have changed so little, despite widespread expectation a decade ago that schools would be quick to embrace change. They are unhappy that gaps exist in internet access for many groups – those with low income, those with lower levels of educational attainment, and those in rural areas. And they still think there is a long way to go before political institutions will benefit from the internet. 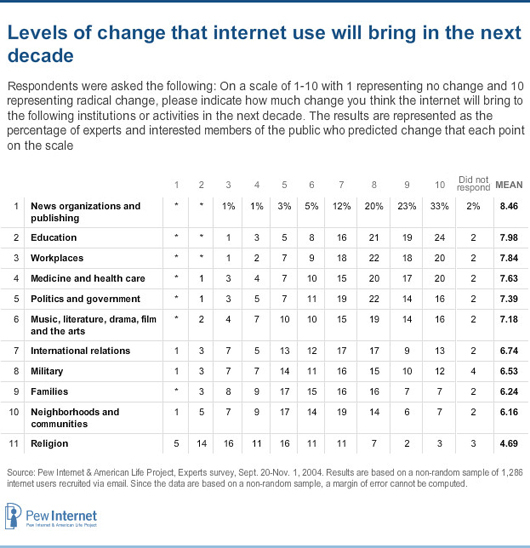 These survey results and written commentary from experts add to a growing database of predictions and analysis from trendsetters about the impact of the internet. At the invitation of the Pew Internet & American Life Project, Elon University assistant professor Janna Quitney Anderson formed a research class in the spring semester of 2003 to search for comments and predictions about the internet during the time when the World Wide Web and browsers emerged, between 1990 and 1995. The idea was to replicate the fascinating work of Ithiel de Sola Pool in his 1983 book Forecasting the Telephone: A Retrospective Technology Assessment. Elon students looked in government documents, technology newsletters, conference proceedings, trade newsletters and the business press. Eventually, more than 1,000 people were logged in the predictions database and more than 4,000 predictions were amassed. The fruits of that work are available at: http://www.elon.edu/predictions/ and they are also the basis for a forthcoming book by Anderson called Imagining the Internet. The material from this survey is being added to the database. We hope the database will provide a resource for researchers and students to assess the evolution of the internet. Further, we invite readers of this report to enter their own predictions at that site.